The Presbyterian Church in Canada’s Youth in Mission program has been designed to allow youth and young adults to accompany Presbyterian mission partners in Canada and overseas through short-term mission experiences. As you share in the mission of the church you will serve others, enhance your personal growth, learn skills and grow in your faith. Youth help fundraise towards the total cost of the trips through the youth contribution amounts. Looking to participate in God’s mission in a new way? 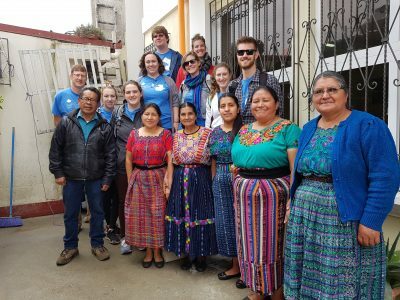 Join the Youth in Mission trip to Guatemala, May 13-26, 2019. Learn how The Presbyterian Church in Canada’s mission partners are sharing the good news of the gospel in word and action. Discover how programs supported by Presbyterians Sharing and Presbyterian World Service & Development are changing people’s lives. Visit projects empowering women to earn sustainable incomes and develop skills in livestock management and marketing. If you have an open mind, a team spirit, a loving heart, an interest in global awareness and a call to serve, this trip is for you. Come, experience and participate in ministry as you visit communities inaccessible to tourists and enter into deeper relationships with local people.